Big boss man of Apple, Steve Jobs, has recently attempted to justify his company’s reasons for not allowing the use of Adobe’s Flash on it’s mobile platforms. It’s an interesting read: http://www.apple.com/hotnews/thoughts-on-flash/. However, all it does is confirm the one deciding factor he claims isn’t a deciding factor: the App Store. Adobe has characterized our decision as being primarily business driven – they say we want to protect our App Store – but in reality it is based on technology issues. 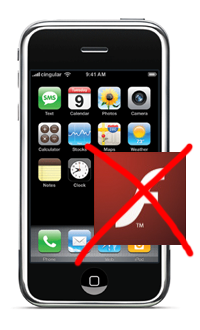 …Adobe also wants developers to adopt Flash to create apps that run on our mobile devices. We know from painful experience that letting a third party layer of software come between the platform and the developer ultimately results in sub-standard apps and hinders the enhancement and progress of the platform. …Our motivation is simple – we want to provide the most advanced and innovative platform to our developers, and we want them to stand directly on the shoulders of this platform and create the best apps the world has ever seen. And the 200,000 apps on Apple’s App Store proves that Flash isn’t necessary for tens of thousands of developers to create graphically rich applications, including games. Not trying to protect your App store, Mr Turtleneck? I’m not so sure. There’s nothing wrong with this, but it once again highlight’s Jobs’ ignorance and, surprisingly, apparent disregard for proof reading; the irony and contradictions in his article above are nothing short of laughable. You don’t like Adobe and you don’t want Flash to be available on iPhones because it represents a direct threat to the growth of the App Store. That’s fine. Just admit it!